http://silentwitness.wordpress.com/. All the information that you wanted and more will be there. Thank you for your interest in comforting those touched by domestic violence. Well, I did post in December but they disappeared. I will not try to make them come back and there were no pictures, so you didn't miss much. I have been knitting up a storm. No snow for Minnesota though. Shawls though. I have 3 requests for a total of seven shawls. 5 of them are done and soon as I finish the 6th the second mailing will go out. The requests are endless. 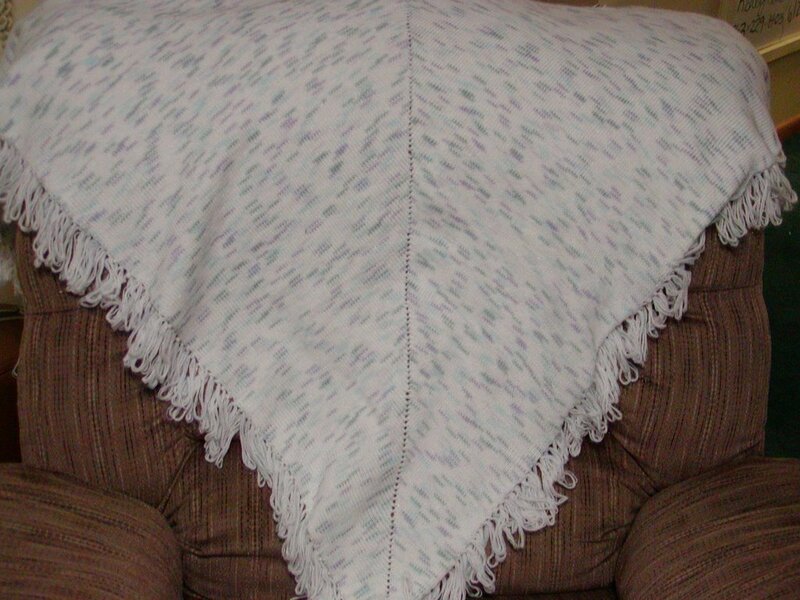 I also needed an emergency shawl for a young woman at church who miscarried for her third time. This was much more difficult because she was 4-6 months along and had to deliver the dead fetus. I felt so bad. I have a prayer shawl for her but I have only seen her once since, I heard about it. I did not have the shawl with me at that time. That will get taken care of. I have been happily reading the Yada Yada Prayer group books. I am on the fifth book right now. They are very good and very real. I don't wish my life to be like hers, but I wish for some prayer group more like that. Maybe that is why it is fiction? Here is the results from my green quiz. Green is my favorite color. It has been ever since I was little. Here is the results to my purple quiz. You should check it out. I donated several shawls and scarves this holiday season to the local domestic violence shelter. Every little bit helps. Well, things are busy as ever. My dd was home from college for the holidays. It was her first trip home. She really only wants to be here to get free laundry and see any other friends that are home from college. She has a service project she wants to do in Chicago. So I have knit up 25 hats for her to take with her and share. I have also worked on the Caps for the Capital Campaign sponsored by Warm Up America. Our school, Totino-Grace High School, is participating and has a goal of 100 hats by Christmas break. We are close. We have 91 so far and 4 weeks to complete an additional 9 hats. We should be fine. At the school Thanksgiving Mass we had 50 caps, and 33 scarves blessed by the Bishop. The scarves and a shawl were sent off right away to Olympia, Washington. I have to fix my sweaters for my niece and nephews. Then block them and a shawl. Then work on a few more hats. I currently have a shawl and a pair of leg warmers on the needles. My secret pal sent me a gift certificate for some yarn off the internet. So I ordered some lovely dk peace fleece. This will be going into the shawl that I am making. This is all so very exciting. Not much else is new. Projects continue and I feel like I am always behind. Wish I could get enough done so I felt like the knitting room was organized rather than a cluttered mess. I know, I know. It's already November and I haven't posted. I have received 2 beautiful shawls in the mail. I will only be able to show you one, as I had to send a box of shawls and scarves off asap to NJ. I went up to St. Cloud last Friday, and learned more about knitting hats adults and premies and making a rectangle shawl. I will go up at Christmas and see what it is like to do diffent pattern stitches on the machine. Right now, I need to manage squares and retangles. I have been exstremely busy with something every night after school. I bring my knitting with me though so at least when I feel rushed, I can relax once I get there. I made a second shawl on the machine but you can't see it because it too went off to NJ. The weather is exceptionally warm and dry in Minnesota this fall. So much so that the land up north the wells are running dry and they do not have enough water for daily living. We need a good soaking rain, before the snow. I know these are random ramblings so I better stop now and fill you in when I am more together. Until then. Well, I finally got the camera and took pictures of the following projects that are done and on their way out of my house. Yeah! First, I want to show you the first item I ever machine knit. Hopefully it won't be the only. 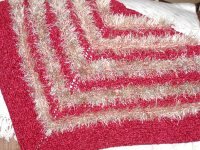 The image on the left is one of two triangle chenille fun fur shawls I made for Sheila's Shawls. The one on the right is the other one. 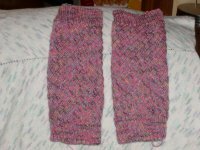 The last picture is a photo of the leg warmers that I made for my niece for Christmas. I have two sweaters in progress for Christmas presents and always one or two shawls in progress as well as some baby hats for the premies for the Caps to the Capital Campaign. This is a project we are doing at school. School is busy, open house and conferences. So no knitting time during these activities. I have not found a way to convince anyone that knitting is a better use of time than sitting and reading and waiting. I will post pictures later. I do not have a camera near by. I received my beautiful scarf and goodies from an absolutely wonderful International Scarf exchange pal. She was great. The scarf in my favorite yarn, and my favorite color. It is beautiful. She is from Australia so I receive a postcard to add to the collection in my classroom. Two skeins of hand spun yarn, again in greens. Can you now guess my favorite color. Also chocolates and some wonderful hand made stitch markers. I love accessories!! Since I have knit for such along time, in my life, 35 years, I like accessories to keep things interesting. 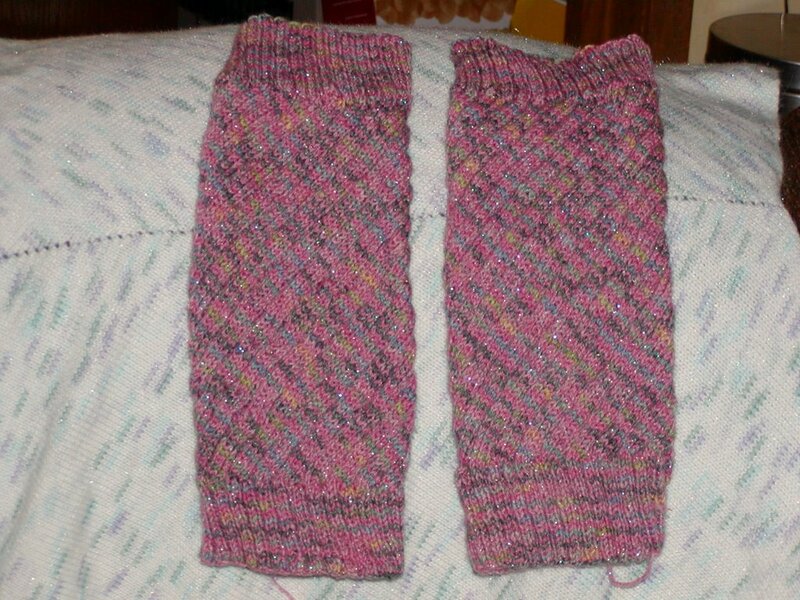 I finished a pair of leg warmers for my niece. 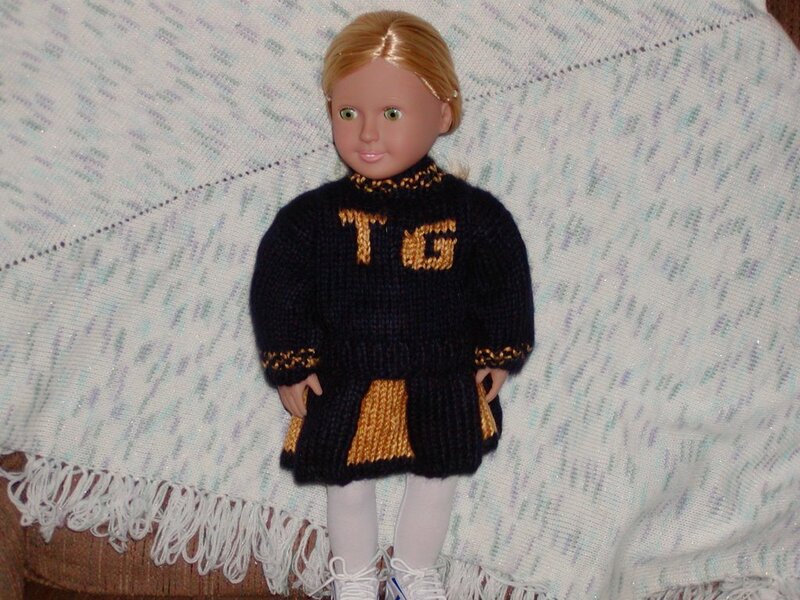 She is an ice skater, so they will either be for her birthday or Christmas depending on if I get her sweater done. I am planning on making two other sweaters for Christmas, as well, for my nephews. We will see how speedily they go, but I have at least one project to finish for school first. I have finished several shawl that when I get the camera I will show you. Last Thursday, I learned to use a knitting machine. That was fun. I made a shawl in about 4 hours. It turned out really nice. Now if I can do that on my own. I tried and have failed at several parts of it. But all of the failing is simply learning. I stop and try again another day, or hour and see what happens. Maybe I should try something smaller than shawls first. I should try some baby hats or slippers. I keep you posted on how it goes. I like my hand knitting much better. But being as old as dirt. I can hardly remember learning to hand knit, other than my first sweater was meant for me and it would have fit a football player. So even then I had failures and continued on. School has been extremely busy with open house and conferences and many other things. 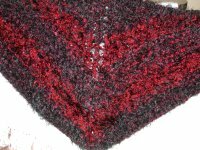 So it has been difficult to post and keep you up to date on the shawl process. I do have a request for a shawl that was designed for the extravaganza. I need to duplicate it the best I can. I have no problem doing it. It will just take time and I will have to do it after Christmas. I attended Knit Out 2006 at Brookdale yesterday. It was very fun. The Glitter Knittner was there and represented the yarn stores. 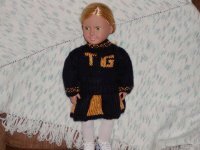 There was much information about the Knitting guild. The Govenor of Minnesota declared this Knitting Week in Minnesota. Woo Hoo! Not many people attended as there was many other activities going on in the Twin Cities. Many People attended the Shop Hop that included hopping to Sheepy Yarn, Amazing Threads, Needlework Unlimited, Three Kittens, Zandy's and Coldwater Collaborative. This sounds like a very fun activity, but when you are on a yarn diet, like I am, not a good way to spend my time. I then went to Augustana Lutheran Church in West St. Paul for a Prayer Shawl Ministry Workshop. Both Vicky Galo and Janet Bristow presented the start of their Shawl Ministry program and created activities and answered questions. It was a wonderful experience. We had guided meditation and talked about how to start and continue a shawl ministry. It was a wonderful experience and I highly recommend it to anyone interested in shawl ministry.